The first thing that comes to mind for most when it comes to pudding is buying one of those little boxes from the store. Unfortunately these are filled with a long list of questionable ingredients and so much sugar that you are certain to be kicked out of ketosis. Homemade pudding may seem like a daunting and difficult task to undergo, but it actually only requires a handful of natural ingredients and a few minutes of your time. It will also be so much healthier for you than any boxed version. Nothing says healthy fat on a ketogenic diet quite like coconut. It is high in healthy saturated fats, can help improve the health of your heart, support your immune system, can improve your digestion, and can even promote weight loss. This coconut pudding is so rich and creamy, you’d never guess it was really good for you. Coconuts are one of the best sources for lauric acid. Not only is this antibacterial and antiviral, but it is also known to protect your heart. Coconut products can help reduce your LDL or “bad” cholesterol, increase your HDL or “good” cholesterol, and is useful in improving blood pressure. Healthy fats like MCT’s or medium chain triglycerides are a form of saturated fatty acid which help to create ketones in your body. MCT’s are also not stored as fat, instead they are used almost immediately for energy. This can help boost your athletic performance and help you power through your workouts. MCT’s will also enhance thermogenesis, or your body’s ability to burn calories. Coconut milk helps nourishes the digestive tract and can improve symptoms of IBS such as diarrhea and constipation. The MCT’s found in coconuts also help fight bacteria and viruses in your body. Coconut milk is also a wonderful option for those with dairy sensitivities and will help reduce the inflammation that can be caused by milk and heavy cream. While you may be a sucker for all things chocolate, change it up every now and then with something rich in coconut like this pudding. 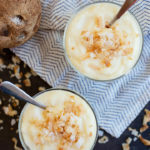 You may just find that your body is craving nutrients found within coconut milk and this pudding is the perfect option for an easy, make ahead dessert option. In a medium-sized saucepan add the xanthan gum, sweetener, and salt. In a separate bowl, beat the egg for 2-3 minutes until pale in color. Add in the milk, coconut milk, and coconut cream and whisk to combine. Pour liquid into saucepan. Cook mixture over low-medium heat, whisking often, until bubbles form and mixture thickens. Remove from heat and stir in butter and coconut extract. Allow to cool slightly on stove top, stirring occasionally to prevent film. Pour mixture through a fine sieve and refrigerate until ready to serve. Sprinkle on toasted coconut to serve.